Whether you need stucco repair for one room or stone installation for a large complex, we do it all. Call (727) 463-3983 today for a free estimate! Welcome To Steve's Stucco, Inc.
We are a fully licensed and insured stucco, plastering and stone work company serving Pinellas Park, FL and Pinellas County. As a family owned and operated business, Steve’s Stucco, Inc. goes above and beyond to offer you outstanding customer service with a personal touch. Whether you need stucco repair, plaster repair, stucco paint, wall plastering, stone installation, stone work design or stone walls, we offer free estimates at Steve’s Stucco, Inc., and there is no job too big or too small - we do it all! If you are a Pinellas Park homeowner with a hole in your wall that needs to be plastered, call us. If you just purchased an apartment building and need to completely revamp the interior, call us. If you want to beautify your home or business with stone installation, call us! We provide exceptional stone work design! Using a variety of natural stones to accent your façade with the color scheme you are looking for, we offer stone installation that can’t be beat! 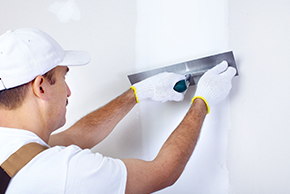 We are happy to take on major contracts, and we are just as happy to take your small home plaster repair jobs. At Steve’s Stucco, Inc. we specialize in stucco repair and paint. It takes expert skill and training to professionally repair stucco and apply stucco paint correctly. We have years of experience offering our complete stucco repair services to homeowners and small businesses in Pinellas Park. We know that we will hit your job out of the park! No matter what type of problem you have, if it needs plastering, stucco paint or repair, or stone work to be solved, we are the pros to do the job! With our team of excellent craftsman, your stone walls will look modern and sleek, your wall plastering will be smooth and even, and your stucco repair will look better than ever! We are confident that you’ll love our work. Call us today and get your free estimate!